You want a fast and tasty meal? Here it is: Thai Curry. I promise you the rice to serve it with will take longer to cook than this. 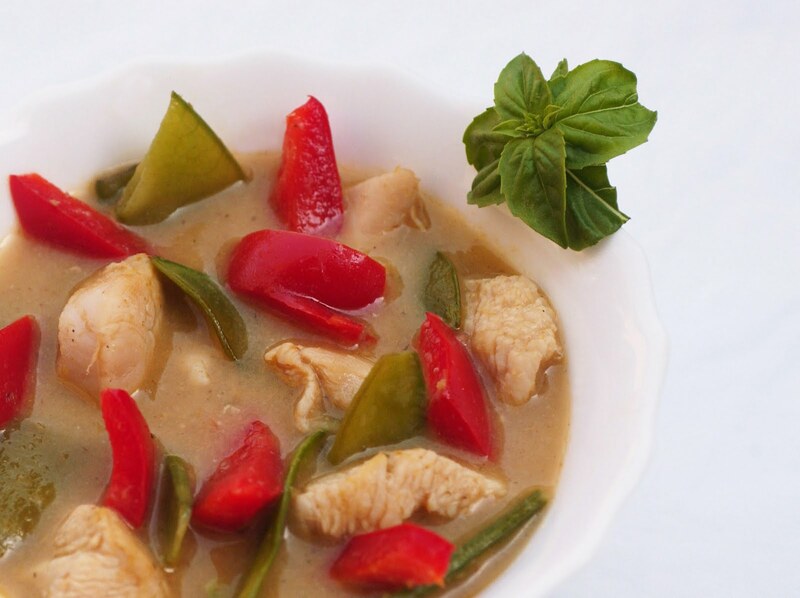 In a Thai curry, you can throw in whatever meat and/or vegetables you want. I always like foods vibrant in color and contrast, so I chose mangetouts and red bell peppers. They are both light and crunchy. The chicken gives a little substance to the curry. By no means omit the lime juice, as it rounds up the the spicy curry taste and the freshens up the coconut milk. Bon appetit!!! Or as they say in Thailand: Khaw Hai Jarern Aharn. Heat the vegetable in a wok pan or other deep pan. Fry the onions and ginger over medium heat until golden brown. Add Thai Curry paste and stir for another minute. Add the chicken strips and fry for 2-3 minutes in the curry mixture. Add coconut milk, stock cube and lime juice and cook for about 5 minutes. Add mangetouts and pepper and simmer for another 3-5 minutes or until vegetables are tender but still a little crispy. Serve with rice.